“We’ll be having prime rib; if you don’t want to eat that, there’ll be salad and stuff…since there’ll only be two of you who don’t eat meat.” – a friend inviting me to a New Year’s feast. This week’s lead article in the NYT dining section was Meatless in the Midwest: A Tale of Survival. It’s the story of an NYT reporter who moved to Kansas City, Mo and is a hard-core vegetarian (I’m not). All that said, I STILL give into a craving once in a great while and have some bacon (that stuff is like crack) or some barbecue (I come from southern folks, it’s in my DNA). And, as such things go, I sometimes politely eat (some of) what’s put in front of me when I’m a guest. But, often, while everyone is digging into the feast…I’m faced with – um – salad. Now, I like salad, but I don’t usually make a whole meal of it. I’m also polite when people who have known me for years conveniently “forget” I don’t eat meat. But, here’s the thing. Just where does my good manners obligation as a friend and guest end and that of the host begin? I’m fine with making a meal of side dishes; I do it home. It’s amazingly easy to turn a “side” into an entrée if you know anything about cooking. Yet, somehow, many people (still) assume us weird veggie people will be happy with a salad, and by salad, I mean lettuce, maybe some carrot and a pale slice of sad tomato. Yummm…Or, hey! We got you tofu! (This when I had repeatedly said I loathed the quivering white stuff.) And, almost invariably, the vegetarian option at hotel banquets is flaccid pasta with canned sauce. Sigh. Really? You went to culinary school for this, chef? Fried Rice. Insanely easy. Can be insanely good (and good for you). Pasta, pasta, pasta. Really, if you can’t boil water and dice up a few veg, there’s just no hope for you. It’s also very easy to go vegan with pasta. Mac & Cheese. Eleventy-billion variations. Soups & Stews. Many recipes are almost embarrassingly easy, and filling. Pretty much any”ethnic” cuisine. – Thai, Chinese, Indian, good ol’ Italian…many recipes are vegetarian and simple. Need a little “expert” help? No prob. Rachael Ray, Jamie Oliver, Mario Batali…and many, many others provide good, even great vegetarian recipes. Check out web sites, such as that of Saveur – lots of veggie options (here are eighteen main courses.) And, Epicurious can get you started on vegan recipes (no cheese, eggs, dairy)… So, really, no excuses. P.S. 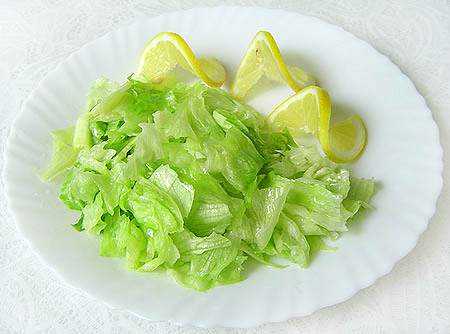 Iceberg can make a wonderful salad, but a main entrée, not so much. It also goes great with vegetarian tacos and enchiladas. Love that crisp snap as a complement to the spice! Here’s a quickie for you. Finely slice, chop up a good tomato. Toss with white balsamic vinegar, freshly ground pepper and some coarse sea salt. Serve as side to home-cooked beans or a comfort food casserole.